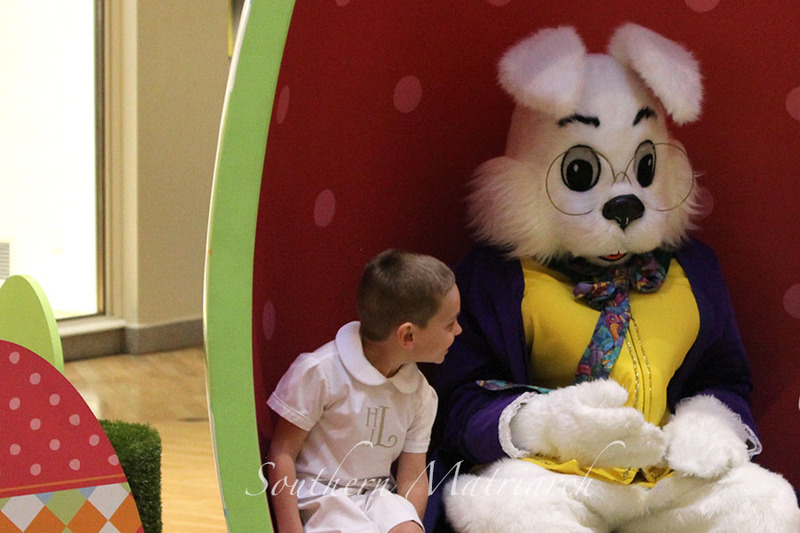 Its time for the Easter Bunny! 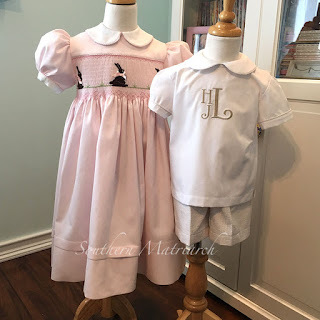 As promised here are the big kid's Easter frocks. These were a lot of fun and I enjoyed making them. Except for the seersucker for Wildman's shorts, this was all from stash. How cool is that? Don't worry I made up for it with the little kids. 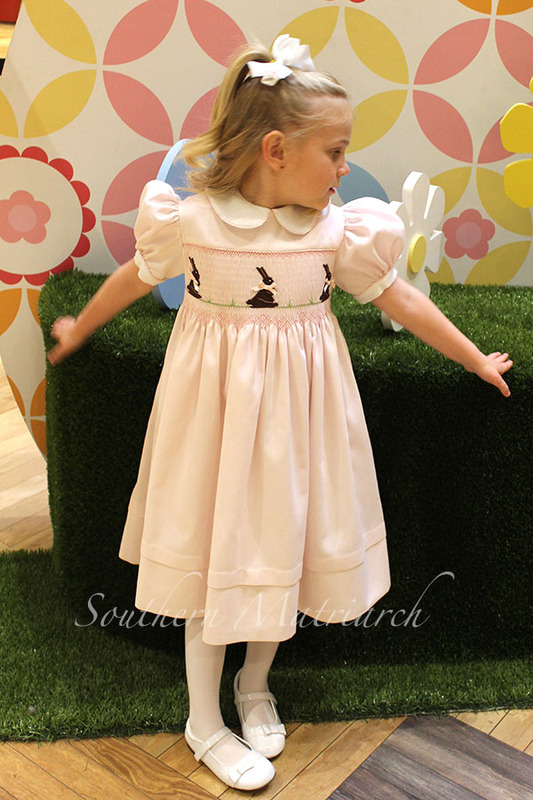 First for Princess, fabric is Swiss pique. I've used it before for a *Freezing play dress. It is a dream fabric. 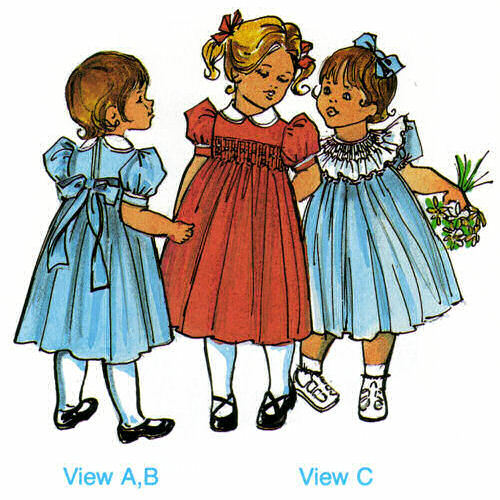 I didn't realize it when I made that play dress but the more you handle it the softer it gets. The previous dress was a down and dirty so I didn't realize how yummy it would get as I handled it so much. Pattern is Children's Corner Lee. 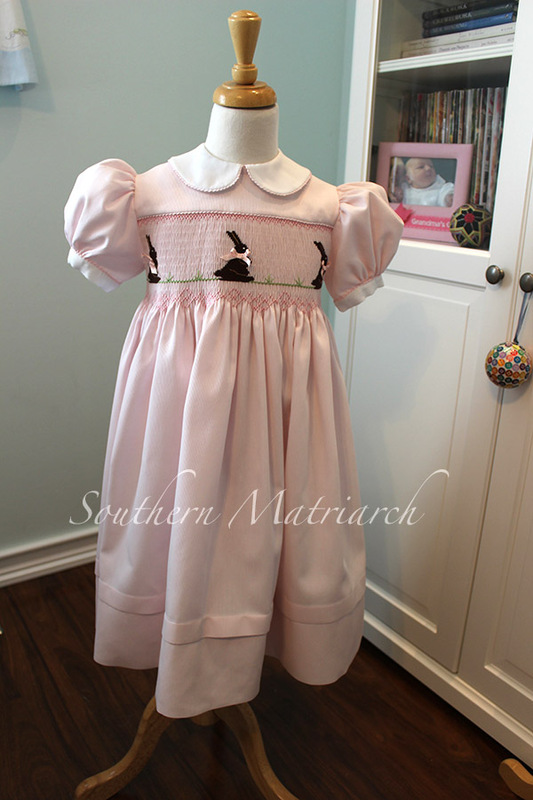 Amazingly enough, I didn't have this pattern in the larger sizes. Smocking design is "Yummy Bunnies" from Creative Needle Magazine Feb 2008. 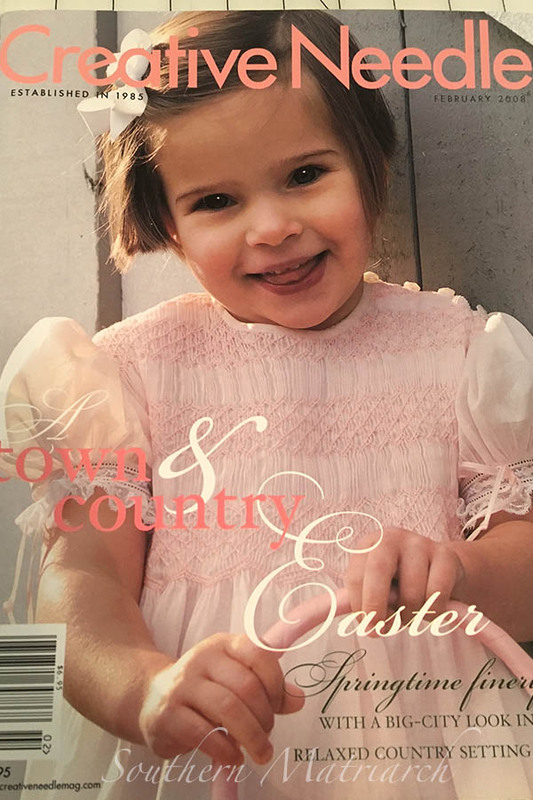 This magazine is long out of print but many issues are available on both eBay and Etsy. In this particular issue there are two bunny plates. I have stitched them both. I have wanted to make this dress for a couple of years. 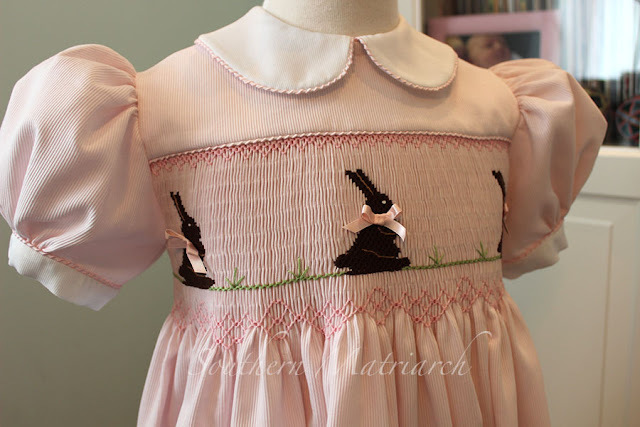 The only thing I would change is I would stitch the bunnies closer together than the 35 pleats apart as called for in the design. Other than that, I love the dress. 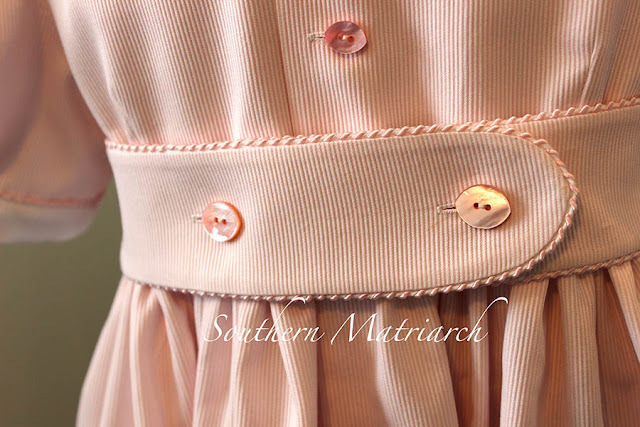 Collar is Spechler-Vogel pique and all is piped with whip stitch piping. The design in the magazine stated that the belt was from CC Anne. If it is, it was not with my pattern, so I drafted my own. I should have taken a photo of the belt pieces before I inserted them, I whacked off about 6 inches from each one. Not sure what I was thinking when I cut them out. Wasted piping. Oh well. I used some antique mother of pearl buttons I have had for years. I bought them from Jeannie B at The Old Fashioned Baby. I love them and longed to find the right project. I think they fit the bill perfectly. She loved it and it fit well. You can't ask for more. Growing into a big girl. She is almost six years old. On to brother. For Wildman, a monogrammed shirt of Imperial broadcloth and khaki striped seersucker shorts. I used Cameron by Ginger Snaps Designs for the shirt and my go to CC Parker's Pants for the shorts. 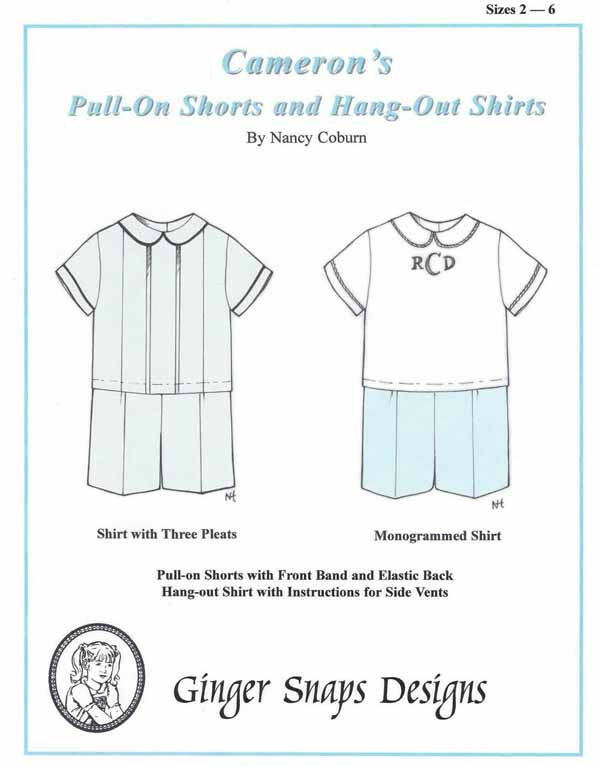 The shorts were lengthened by 1/2". A size 4 still fits in the waist but Wildman has long legs. Monogram is Francisco font from Apex Designs. It stitches beautifully and is elegant without being too girly. 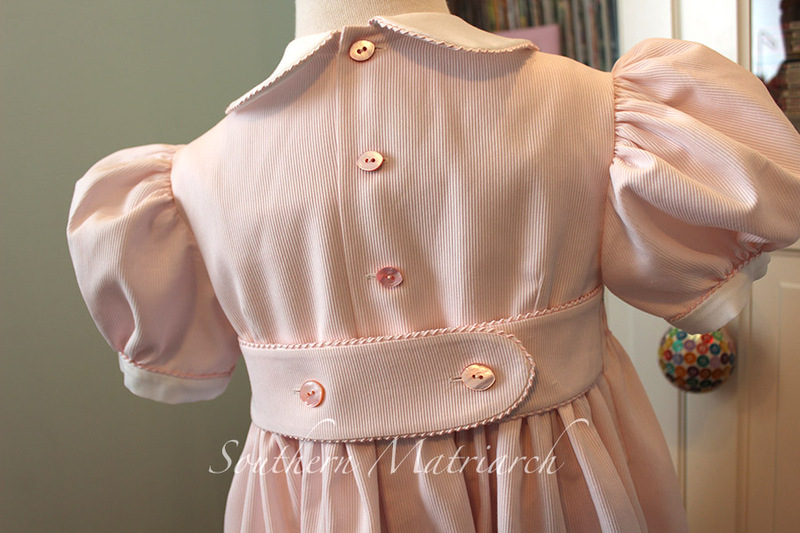 Collar and sleeves are trimmed with seersucker piping. I used the alternative to setting in sleeves with a pleat on the sleeve cap instead of easing. I don't like it. Buuuuuut it was after midnight and I was tired so I ran with it. Live and learn. Getting a photo of this boy is next to impossible. This is the look you get when you implore him to be still. This was as good as Mimi could get. I love his khaki colored saddle oxfords. 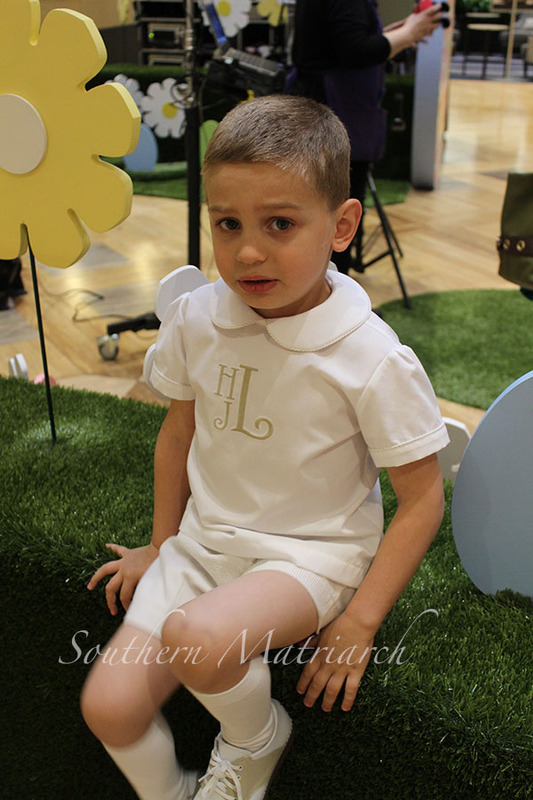 I wish I had captured a photo of the moment we discovered he had rolled his knee socks down to his ankles, maw maw style. This was discovered as we browsed the Coach and Tory Burch stores. Geez Louise! 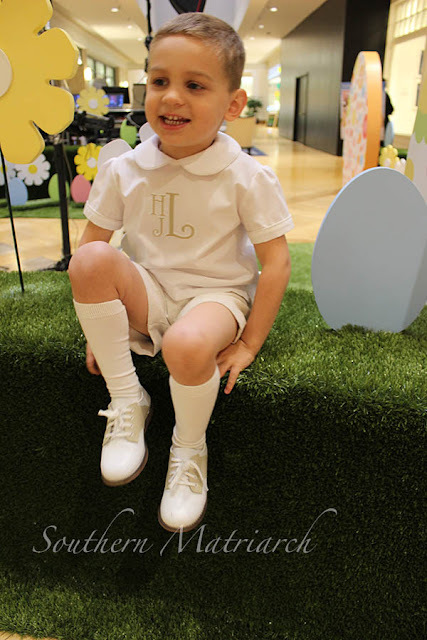 Wildman is 4 and half. I fear this may be momma's last year for knee socks and short pants. She would have loved to have put him in a jon-jon. That ship has sailed. 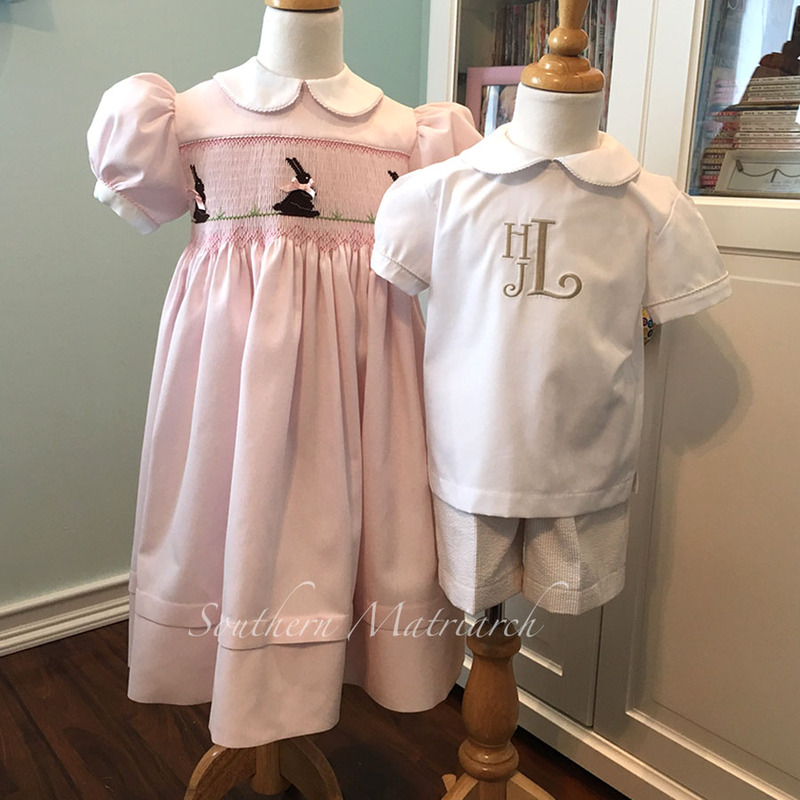 Tomorrow will feature the little ones Easter finery. That dress is to die for! I'm not a picture smocker, but may have to try that, I'll look in my old CN's to see if I have that issue. Well done!! Thanks. It was fun to stitch. Please tell mw where you purchase your swiss pique from? Happy Easter glad you are back! Nothing better than a Lee at Easter. 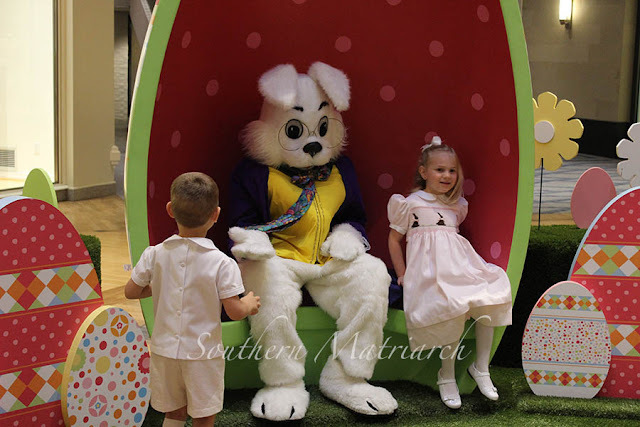 LOVE the chocolate bunnies! The grandkids are getting big. Beautiful work. Love them both! They are so grown up!! 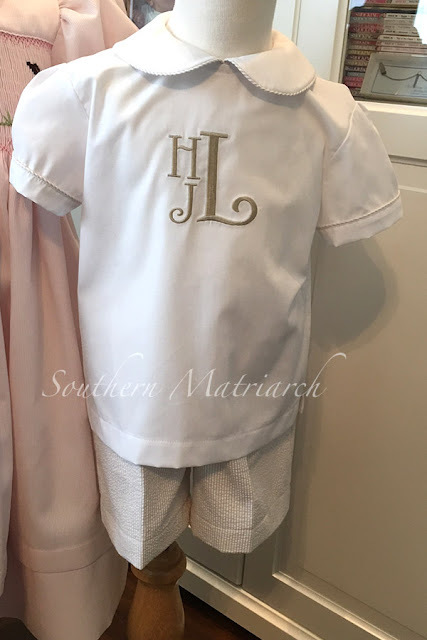 That monogram is perfect for your young man.